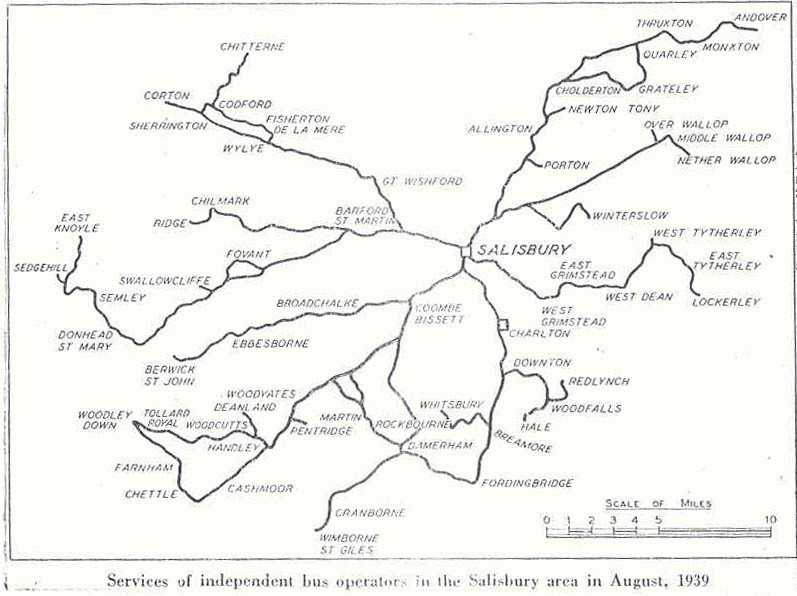 Some information that has come to hand enables a list of independent routes running into Salisbury in 1939 to be set out below. 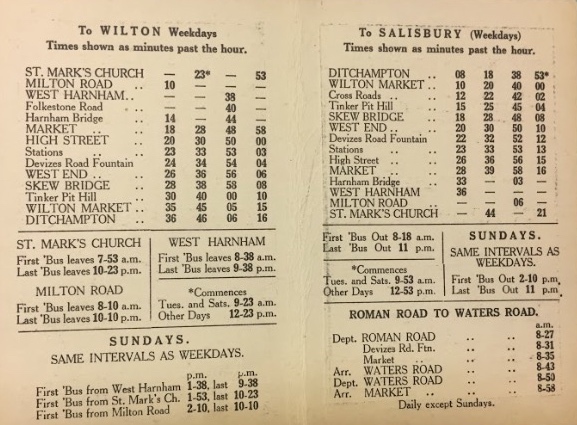 The extracts are taken from a wartime edition of Motor Transport published in 1943, and it is interesting to compare the routes listed with those appearing in the 1949 Salisbury District timetable. Much is unchanged between 1939 and 1949 - but not everything. Oborn of Ebbesbourne Wake sold to Wilts & Dorset in September 1939, as did George Young of Damerham and then Lever & King of Fovant in July 1949. 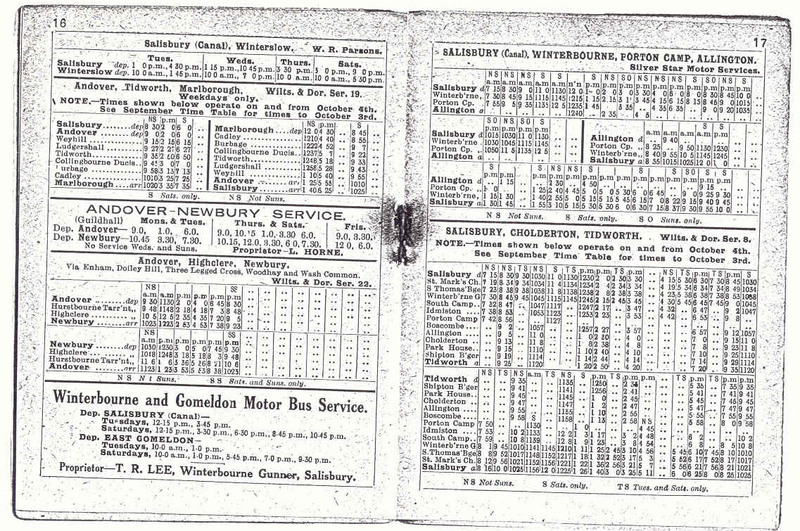 There is also a selection of five timetable pages from the October 1930 issue of Knights Salisbury rail and bus timetable. There are familiar names here like Silver Star of Porton and Skylark of Woodfalls, but also names long disappeared like Lavington and Devizes who sold to the Bath Tramways company in 1932. Several of the other names appearing in Knights were acquired by the Wilts & Dorset company during the 1930s. 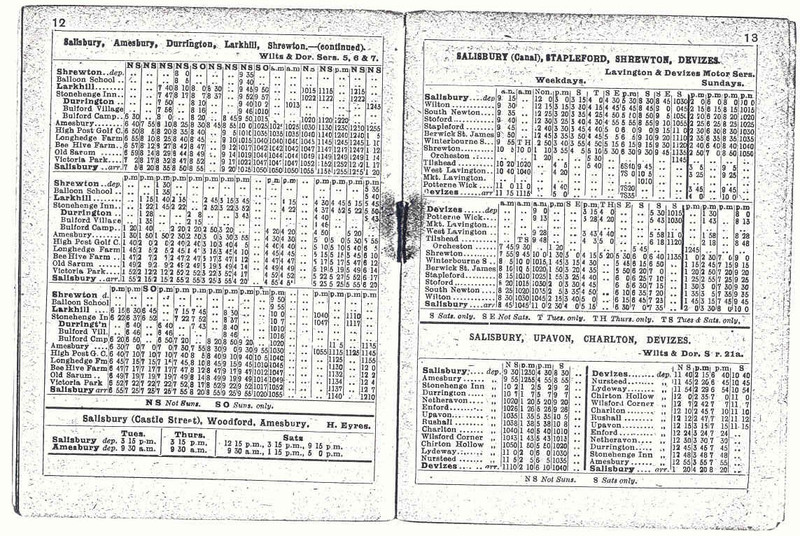 And lastly there is one of the earlier timetable sheets from the Wilts & Dorset bus company. Our illustration is for July 1920 - the company had only been established in March 1915. Then but a fledgling enterprise, it was to grow to become the most significant operator on its patch before the merger with Hants & Dorset in 1972, acquiring many other operators and their routes in the process. A kaleidoscope of memories, a pot pourri of information. The last of the 'traditional independents' working into Salisbury was Bells of Winterslow, who sold their business on retirement in 1999. First of five illustrations from Knights timetable October 1930, showing the city services of Sparrow & Vincent (Victory Service) which had commenced in 1927 and whose routes and 16 vehicles were taken over by Wilts & Dorset in November 1933. There appears to be an error in the Victory Service timetable below: the journeys leaving Ditchampton at 59 minutes past the hour should be shown as proceeding to Milton Road not West Harnham. 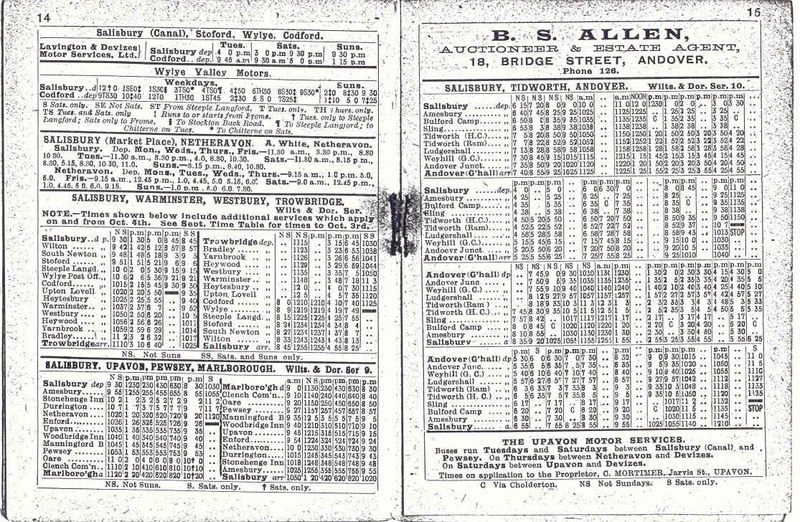 A card timetable from 1929 for Sparrow & Vincent appears lower down the page. Also appearing is Cockle's route through the Woodford Valley to Amesbury, started by 1924. This passed to Wilts & Dorset a little earlier at the end of September 1933. 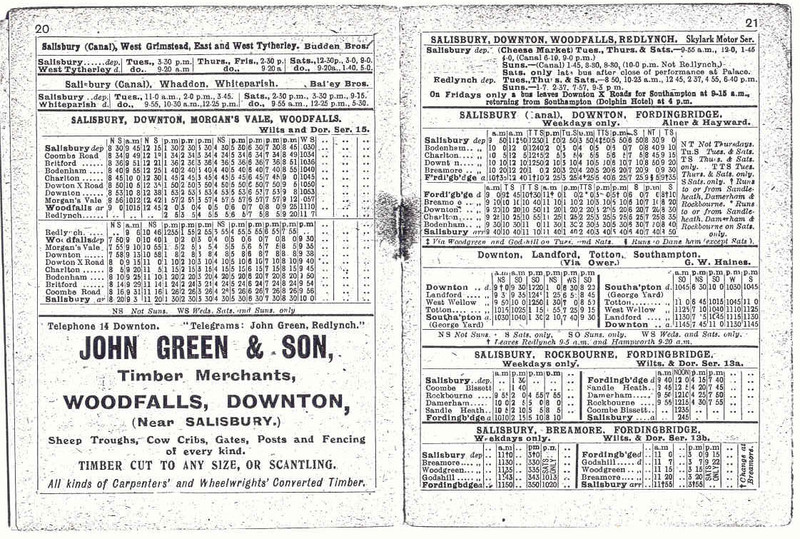 Second set of pages from Knights for October 1930, showing the Lavington & Devizes service to Salisbury (later run by Bath Tramways). Lavington became substantial operators in and around the Devizes area. Also shows Harold Eyres of Amesbury running in via the Woodfords. The third page, including Wylye Valley (H. Couchman of Codford); Alfred White of Netheravon (to Wilts & Dorset in November 1932); and William Charles Mortimer of Upavon (also to Wilts & Dorset in November 1932). Note that Wylye Valley and Lavington & Devizes appear to be in serious competition on the road to Codford. The fourth page has Wilfred Parsons route from Winterslow via London Road to Salisbury (to Wilts & Dorset in November 1939); Thomas Lee's service from Gomeldon which passed to Silver Star in 1949; and Silver Star's own route to Porton Camp and Allington (started 1923, to Wilts & Dorset in June 1963). Comparing the Silver Star timetable with the Wilts & Dorset service 8 timetable below there is evidence of competitive timings, especially between Salisbury and Porton at works times (eg both firms leave Salisbury at 7.15 am and both leave Porton at 4.45 pm). The fifth page below has timings for Budden's route from Tytherley (taken over from Hedley Pragnell in October 1927). Buddens went on to take over the bus routes of Moore's of Lockerley on 30th September 1951. The remaining Tytherley-Salisbury route passed to Wilts & Dorset in September 1994. Frederick and Reginald Bailey's service from Whiteparish (running by 1919 and was sold jointly to Wilts & Dorset and Hants & Dorset in October 1936). The Skylark service from Downton and Woodfalls (running by 1926 and sold to Wilts & Dorset in March 1951). Alner & Hayward's service from Fordingbridge (running by 1925 and sold jointly to Wilts & Dorset and Hants & Dorset in July 1938). Lastly Gilbert Haines route from Downton to Southampton (to Wilts & Dorset in January 1932). 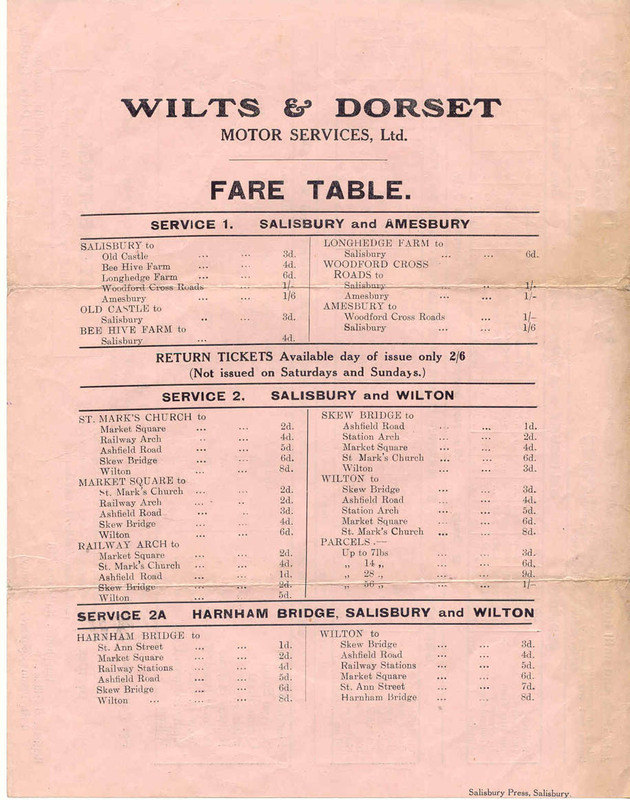 The July 1920 time and fare tables for Wilts & Dorset's local services in the Salisbury area. 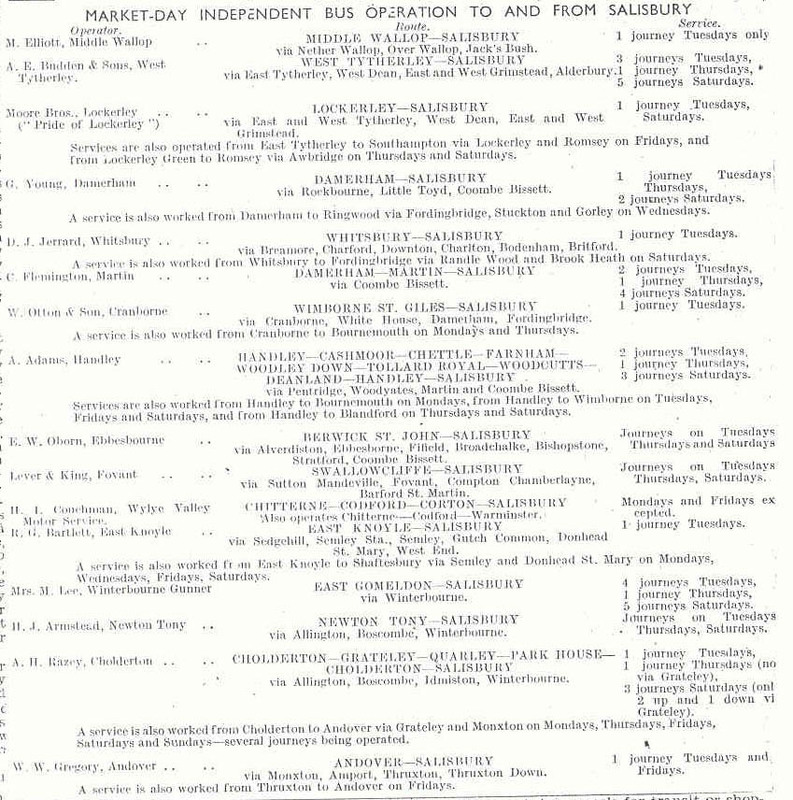 In March 1915 they had bought the business of A A Brewer of Ringwood and acquired his routes from Ringwood to Southampton and Ringwood to Salisbury. The latter was built upon from April 1920 with the introduction of a Salisbury - Ringwood - Christchurch - Bournemouth service; this soon became a joint service with Hants & Dorset. 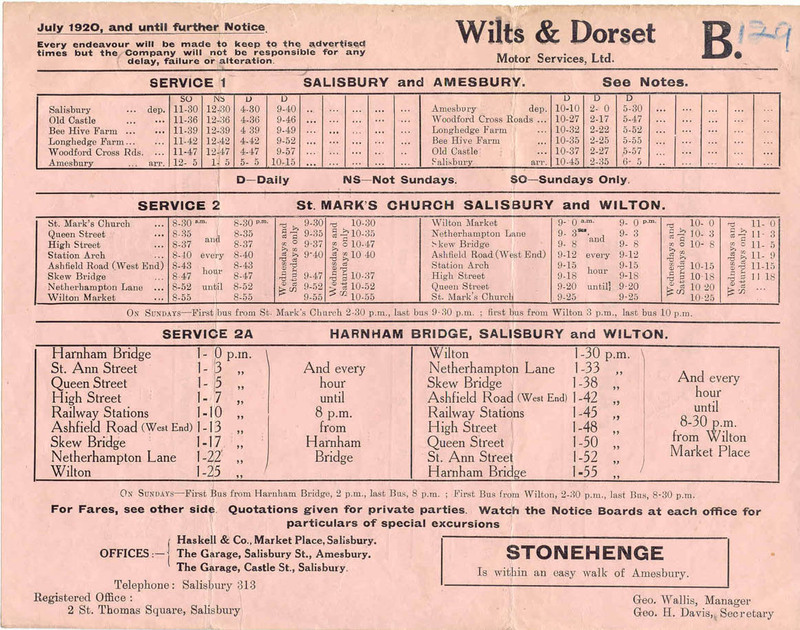 Competition for Wilts & Dorset on the Salisbury city services from 1927 to 1933. 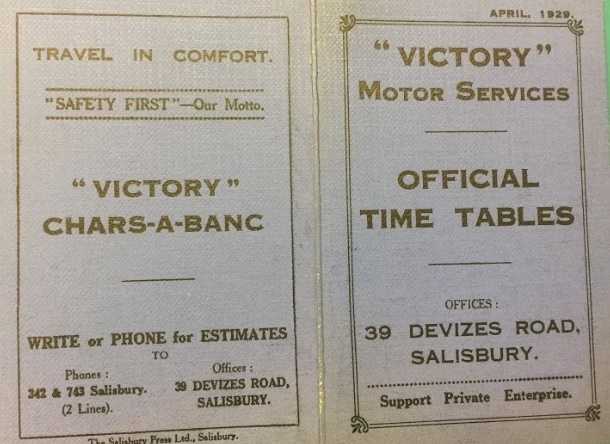 Below is the April 1929 timetable of Messrs Sparrow & Vincent, trading as Victory Motor Services. 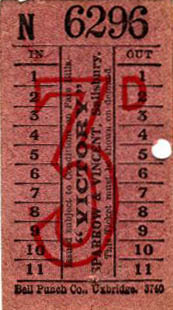 A Bell Punch ticket from Sparrow & Vincent whose buses competed with Wilts & Dorset on city services in Salisbury from 1927 to 1933; they also ran a route to East Grimstead, taken over from Archie Curtis of West Grimstead in 1930. 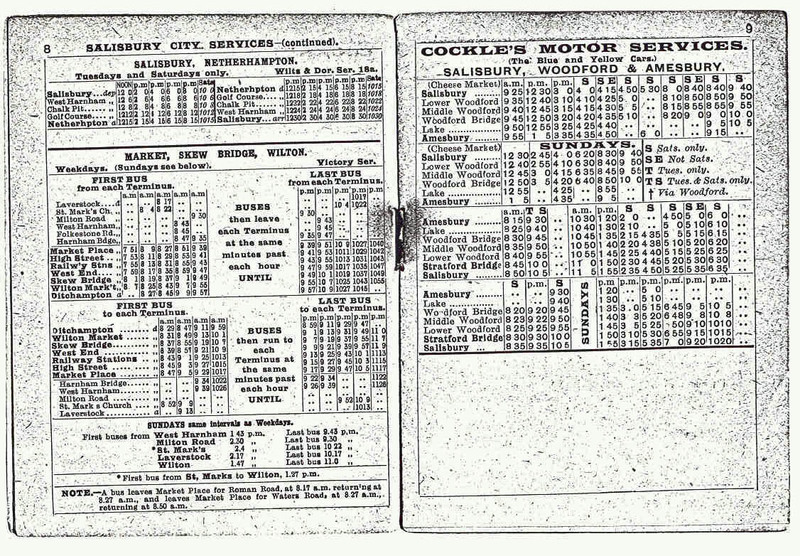 An Insert Setright ticket from Silver Star Motor Services, as used post war on the route from Salisbury through the Winterbournes to Porton, Idmiston, Boscombe and Allington.